Choosing a headstone is always tough, given the circumstances in which you’ll be making the decision. With a lot of different design options available, you may also be uncertain about which headstone is the most fitting tribute to your loved one. Arguably the most important factor to consider is the quality of the headstone, as it is an investment that will need to stand the test of time and also be aesthetically pleasing. Good design and great quality go hand in hand, bridging cultural divides and personal preferences. Here are a few of the best bespoke headstone designs that are available today, which should help to give you some guidance and inspiration. Ultimately you’ll see that when you choose beautiful headstones, it will be money well spent. Traditional headstones designed for Muslims are available in a number of styles. However, there are a few consistent themes and features that tie them together. Gorgeous black granite is a popular material, providing an excellent counterpoint to finely crafted lettering engraved on the surface and picked out with genuine gold leaf. Other colour options are available, including mottled green and grey-flecked white. A polished finish is also commonly selected, as this brings a premium sheen to the surface and will keep it free from blemishes for as long as possible. Typically these headstones are etched with prayers chosen by the family which reflect the individual. When it comes to Islamic headstone designs, templates can be based on classic shapes, or be based on the silhouette of a mosque’s dome. Headstones which memorialise the life of a loved one are common, but there are some unique ways to approach this. For some headstone designs, ideas can include angled stones with a midway split that creates an eye-catching representation of an opening door. This also provides room for a statuette to stand in the opening, welcoming the deceased into the next world. Black granite is once again the material of choice here, but this time it provides a contrast to the white stone of the statuette. It is this kind of attention to detail that makes all the difference and elevates a headstone to new heights. The split stone design also means that there is more room for extra engraving to be carried out, whether you want to add a pretty pattern as seen in the example, or leave the space blank for future use if it is to be a family plot. Beautiful headstones can say a lot about the person that they represent through a design that showcases the passions and pastimes they pursued in life. For example, a custom monument designed to depict an entire drum kit, complete with metal cymbals and portraits of the person who has passed on taking up the centre of the kick drum, has gained attention since its establishment in the US. This kit demonstrates that headstone design ideas can be respectful and playful at the same time, while also showcasing the different skills that can be used to make the materials look like other objects. If your budget can accommodate this kind of unique design, then you will appreciate the effect it can have. A lot can be achieved with the materials used to construct headstones and there is always room for flexibility and personal touches to be added, even if you do not want to select something as unusual as this drum kit memorial. Headstones can be elegant and intricately constructed, which may be important if you believe that the person they are for would have appreciated the craftsmanship and skill involved in their creation. This headstone, featuring a violin emerging from a flowing scroll peppered with musical notes and the family initial, is a perfect showcase for truly stunning design. Unlike some modern headstones that are tailor-made rather than based on a template, this example is a combination of carefully-honed skill and creative ingenuity. This is not something you can achieve with an off-the-shelf headstone. The conspicuous complexity of this headstone might have been a little gaudy, but the designer has sensibly chosen to sculpt it from grey stone. This means that it does not dominate the landscape in which it sits, but rather acts as a subtle addition that is still undeniably beautiful. The stone is also large enough to allow the finer details to be added and remain visible from a distance. Smaller headstones can be constructed using similar techniques, but their full impact may not be apparent until you get a lot closer. Once again it all comes down to budget and the good news is that beautiful headstones are available across every price bracket. 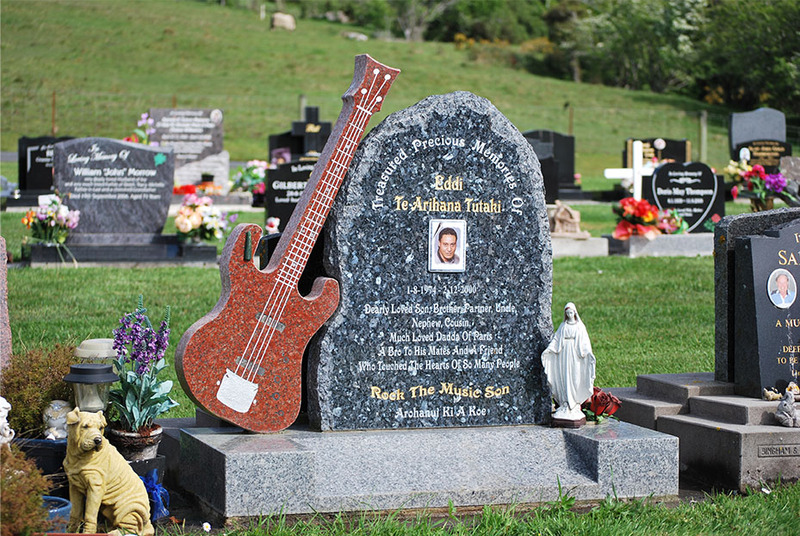 Pop culture is increasingly being reflected in headstone designs, particularly in tragic cases where people want to remember and memorialise those who were taken from their families at a young age. This headstone features Winnie the Pooh and his friend Christopher Robin, portrayed not in sombre mourning but with playful smiles on their faces. This is an excellent option for echoing the joy and laughter that the person brought into the lives of others. Like the custom drum kit headstone, the design looks back on a life and celebrates it, which is something that mourners will appreciate on subsequent visits. A character headstone design like this is capable of demonstrating the versatility of modern masonry techniques. For many people, having an angel or a cherub looking over the grave of a loved one may not be on the agenda, but this gives them an alternative which once again is a bit more personal, unique and engaging. 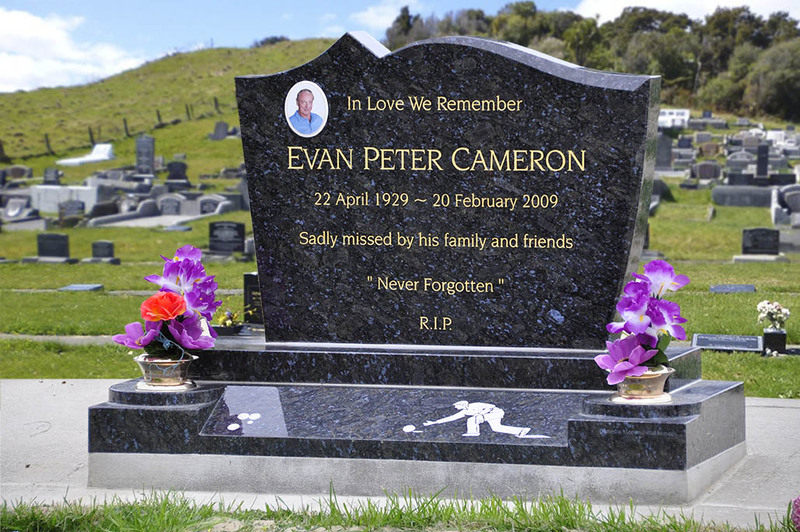 A headstone design has to be chosen based on a number of merits and it is vital to bear in mind that it is something you will be coming back to again and again over the years. You will want to make sure that these return visits you make to pay your respects to your dearly departed are not tinged with regret relating to the headstone itself. If you are looking for high quality headstone design ideas, it makes sense to get in touch with the professionals. This is not a decision you will want to make alone and you will need to weigh up all the options available, rather than rushing ahead before you are completely comfortable. The design should factor in the style and shape of the headstone, as well as the material used and the engraved message that it carries forward. Life can be a challenge, especially after bereavement. Thankfully this is one aspect that you can control confidently.